The Rangers sure are exciting these days. They’re only two games behind Houston for the AL West lead and one game up on Minnesota for the last Wild Card while still holding the title of The Best Team With a Negative Run Differential. That is, if nothing else, an unwieldy banner. It’s the banner equivalent of Jarrod Saltalamacchia’s name on a t-shirt in that it would start on one side and end on the other. Negative run differential or not, the Rangers are winning games and doing it in exciting fashion. 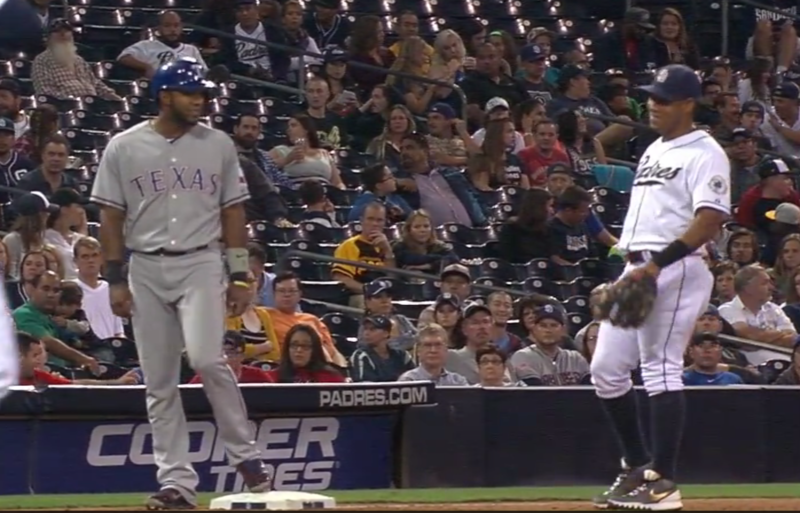 Tuesday the Rangers beat the Padres while Elvis Andrus stole home. I’m happy that happened because that this is an article about Elvis Andrus stealing home and if he hadn’t stolen home this would be a pretty weird article. The Rangers have had some good luck in addition to playing well. For example, the San Diego Padres just wanted to play a baseball game Tuesday. I’m not even sure they wanted to win it. I mean, they’d probably have been fine with winning, but they’d have been fine with not winning, too. Let’s just play a game, they probably thought, then get some sleep. Instead they got Tuesday’s game which was much, much worse. Going into the seventh inning everything was fine. Can’t wait to get some shut-eye, the Padres probably thought! The score was 4-4 and the Padres got the first two Rangers out. 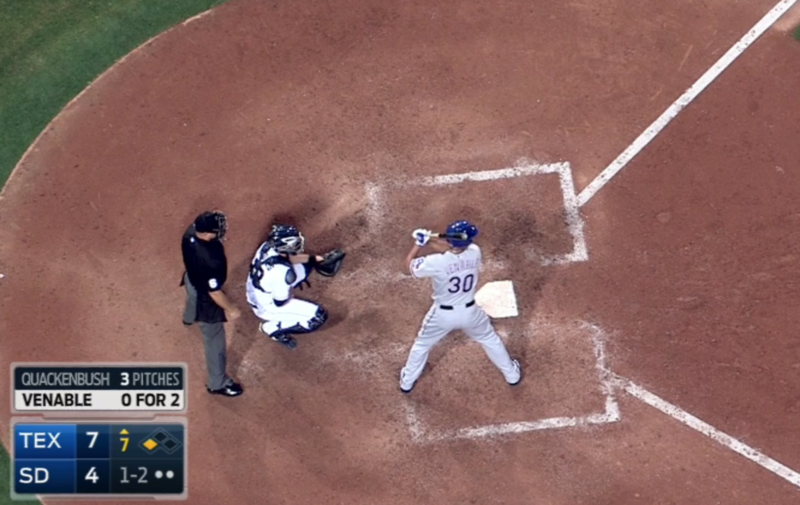 Then Prince Fielder singled. That was enough for manager Pat Murphy to replace pitcher Marc Rzepczynski with Shawn Kelley. Adrian Beltre greeted Kelley with a hard single to left. Kelley’s first pitch to Rougned Odor, a slider, slid past catcher Derek Norris and the runners moved up to second and third. That prompted the Padres to walk Odor intentionally, bringing up our protagonist, Elvis Andrus. That is the cherry on the nose of the guy who has fallen over backwards because he was just punched in the throat. The Padres announcers are complaining about Voodoo dolls (little do they know!) and Andrus is kibitzing with third baseman Yangervis Solarte when Quackenbush gets the throw back from new catcher Austin Hedges. 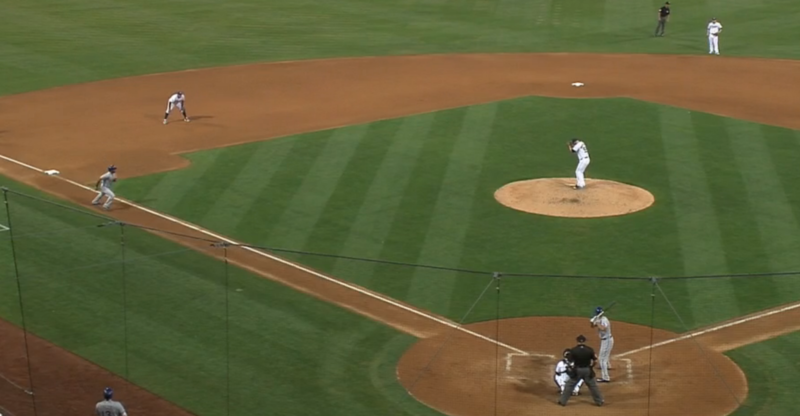 At this point the Padres broadcast offers us, for some unknown reason, an overhead view of the home-plate area. This means that, in addition to Quackenbush and apparently the rest of the Padres on the field, the announcers aren’t paying any attention to Andrus on third, either. That’s Jacoby Ellsbury stealing home off of Andy Pettitte of the Yankees back in 2009. My favorite part about that is how Ellsbury runs so fast he stumbles and falls at the end but is still safe easily. Ellsbury stole 70 bases that year. Dude was fast. Andrus stole 42 bases in 2013 so he’s no manatee either. Watching Quackenbush’s three pitches to Venable, I’m not sure he ever actually looks at Andrus. He might, the camera isn’t on him all the time. I’ve watched both broadcasts to check, but if he does look over I didn’t see it. This could be Andrus’ first clue. Here is the play unfolding just before anything happens. So he starts to go. Nobody cares. Credit Spangenberg with dropping his glove to his waist. Although maybe it smells bad, I don’t know. But we’ll credit him anyway. Solarte has looked up from his socks. He deserves credit, too. Andrus is now in full sprint. There’s no turning back. Solarte and Spangenberg haven’t noticed. Quackenbush is still in the midst of coming dramatically set. If this were a song we would have reached the jazzy interlude. This is about where the Padres notice what is going on and Andrus is almost halfway home. This is checking your pocket after the pickpocket shook your hand and you waved to him as he walked out of the bus station. Solarte is doing the only thing he can do, which is cover where Andrus was, in case there’s a break in the space-time continuum and Andrus reappears at third base. Quackenbush has removed his glove from his face and maybe, out of the corner of his eye, notices something. 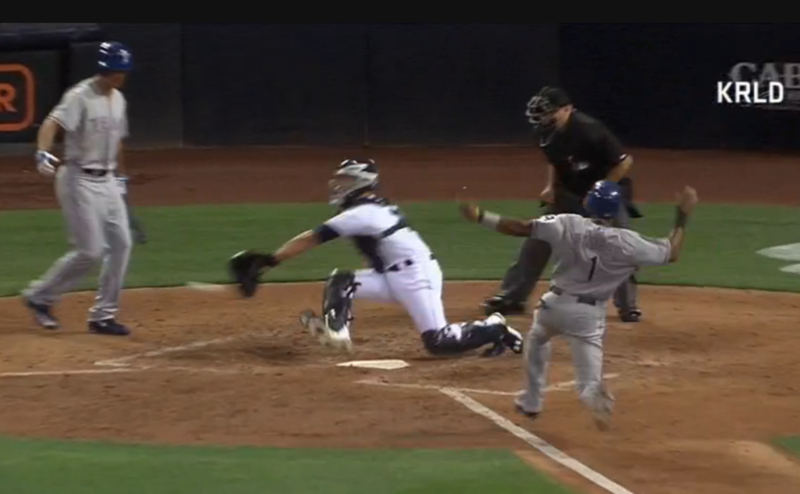 Spangenberg hasn’t moved an inch. He’s mentally ordering popcorn. It’s not good and Andrus is safe. And the Rangers are all smiles and pats on the head (except for Beltre) and the Padres are left to wonder how two outs with nobody on turned into four runs, two injuries, and an embarrassment that promises to last beyond this dreary campaign. But that’s the thing. The Padres had their chance. Quackenbush didn’t have to throw over to third. He could have kept an eye on Andrus. He didn’t. Solarte could have shouted when he saw Andrus go. He didn’t. Hedges had a clear view down the baseline but did nothing, and if he said anything nobody reacted to it. Then Venable presented Quackenbush with a get out of jail free card by stepping out of the box. All Quackenbush had to do was ignore Andrus and throw a strike. He didn’t. The Rangers are an exciting team. They’re making a run for it, but baseball is a zero-sum game. When one team wins, the other loses. On Tuesday, Elvis Andrus pointed that out to a team it didn’t need pointing out to in an inning that will live on inside medical files long and GIFs long after the Padres’ season officially ends. For Andrus and the Rangers they hope this is only the beginning. For the Padres, well, they stopped reading a long time ago. 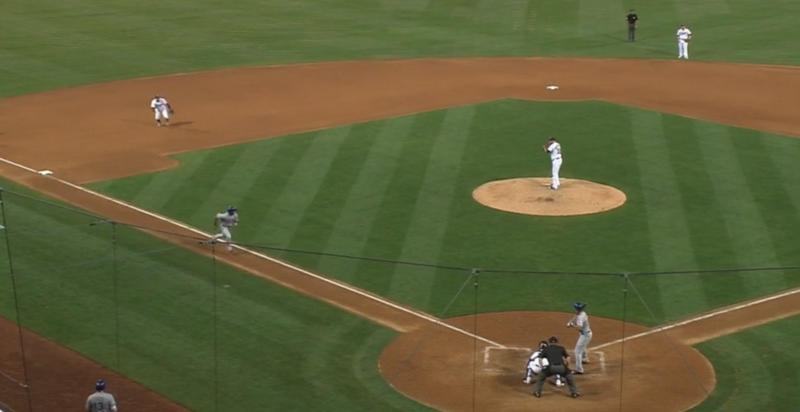 We hoped you liked reading Elvis Andrus Steals Home, Padres’ Souls by Matthew Kory! Spangenberg, Quackenbush, and Rzypczynski? Oh my! I assumed they were Keyser Soze’d from some odd collection of objects in Matthew’s office.